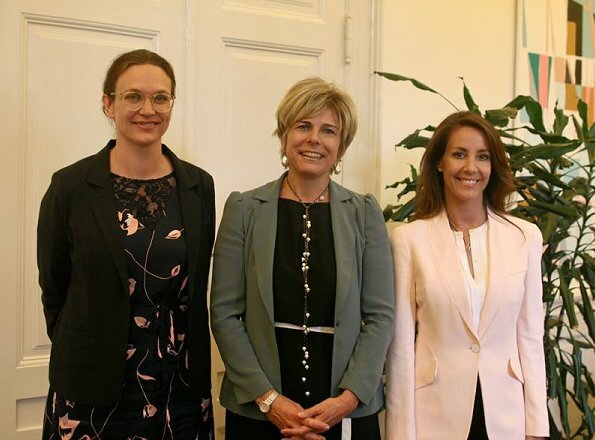 On June 12, 2017, Princess Marie as patron of Danish National Commission for UNESCO, attended a meeting on "Literacy" with Princess Laurentien and Minister Merete Riisager Andersen at the Ministry of Education building in Copenhagen. Princess Laurentien's hair looks so modern and easy. It would be refreshing if some of the other royal women would get up the courage to chop off their overly long hair. That look, long hair, is getting boring. I like Laurentien's haircut, too, but that's also very ordinary and a bit boring, you see it everywhere from Stockholm, Copenhagen to Paris and Madrid on almost all women from 60+ !! And the younger royals have sometimes hairdo and almost always, when they wear tiara ...... great with that kind of variations IMO. I think Marie looks fresh and beautiful, absolutely not boring with long hair! What about short hair of Princess Charlene? @ Amy, I absolutely love the short Pixie Cut of Charlene, Garcon Style, it is well done, a really good haircut, edgy but elegant and it suits her so well, much better than the long hair she wore at her wedding day, which was the same old boring, non inspiring style, we see over and over again. Of course your hairstyle depends on the rest of your body, but she, Marie, is not very adventurous in that department. She certainly isn't alone, though. I guess among younger women around here and in photos from other places, long straight hair is about all that the majority knows. I like when they play with braids, parts in different spots, shorter cuts. Why not, when you know that you will be photographed just about every day? Put in some effort, have some fun! 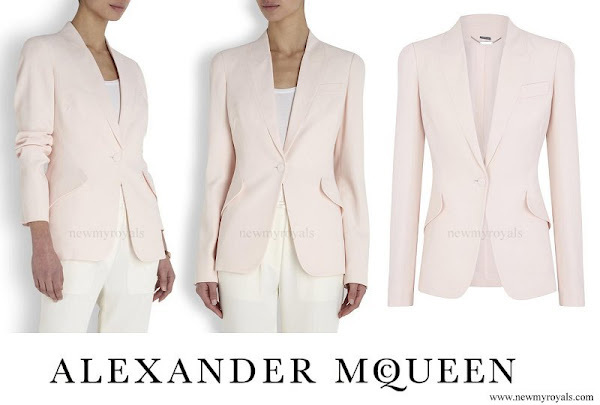 I like Marie's jacket (love the colour) but I wouldn't have chosen that split neck blouse under it. Too many clashing geometrical shapes. It looks far better on the model. is boring + out of date, how must she style it then. Then of course there's Diana's hair, but now everybody will say it looked like a helmet, oh, how I LOVED her "crowning glory,"
even with the new styles, round 1995,-96, visiting Chicago, Washington, etc etc. @ Roylaty fan, I agree with you, Letizias Bob was BREATHTAKING!! whereas her long straight hair now is plain and boring. Just as an add on, I totally agree re Letizia. It far suited her frame and face. It didn't restrict her wearing it straight or curled. At the moment, the length is not in proportion to her frame. "Royalty fan": ??? What's going on? Marie has tried a shorter style, and IMO it just didn't suit her. Lauretien suits her hair short. I agree…… and Mary had it also a very, very short time (before/after the birth of Isabella ?) and it didn't suit her either! Mary and Marie face shapes don't have 'cheekbones' which make that kind of haircut not so suitable for them as for eg on Letizia, Charlene and Caroline of Monaco, just my opinion. Ma princesse Marie est trop bronzée ,sa peau perd de l'éclat. Yes, Rainha, for me too.